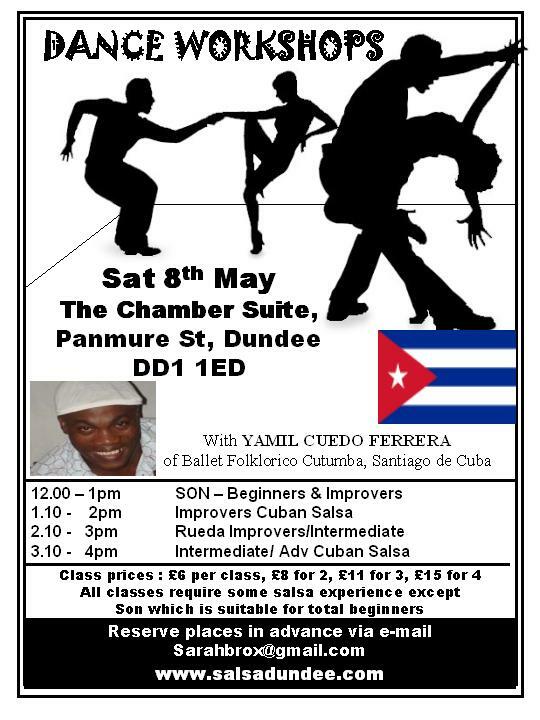 Come & try out Cuban dance with YAMIL CUEDO FERRERA ( from Ballet Folklorico Cutumba dance company, sSantiago de Cuba) on Sat 8th May at The Chamber Suite, Panmure St, Dundee DD1 1Ed see class page for directions. Classes £6 for 1, £8 for 2, £11 for 3 and £15 for all 4. Please email sarahbrox@gmail.com to reserve places indicating which classes, people can turn up on the day too. 12-1pm- Cuban SON – all levels- Son is the predecessor of Salsa, no dance experience necessary, but will be something for those with Son dance experience too.